The Old Town Canoes and Kayaks Vapor 10 is one of the most popular hard side sit-in recreational kayaks sold on Amazon, and is cited by many satisfied customers as one of the best boats for the money. With superb tracking and control for its size, the one-person Vapor 10 recreational kayak is easy to maneuver across flat lakes and mellow ponds for both novice and expert. The Vapor simply becomes an extension of you as you navigate the drink. This lightweight 10 ft. yak only weighs 47 pounds, and carrying handles are molded right into the front and rear of the linear polyethylene body for easy transport to and from the water’s edge. The roomy cockpit measures 19.5 inches wide by 48 inches long and ensures that the solo paddler has plenty of space to stretch out to enjoy the ride. The Glide Track molded foot braces keep your legs positioned comfortably as you navigate. Limited time offer: Enjoy an incredible deal on Old Town Canoes and Kayaks Vapor 10 – on sale at Amazon.com today! Adjust the seat on the go with a quick pull of the cord gripper to maximize your comfort. A cup-holder is molded into the hull dashboard, but given the large size of the cockpit, the cup-holder may be out of reach for smaller paddlers while sitting on the comfortable seat cushion. You won’t want to get up off of the Comfort Flex seat to grab your drink! The seat padding contains memory foam material that conforms to your unique shape. Load up the Vapor 10 recreational kayak with all you need for a day on the water or a weekend camping trip. The day well molded into the stern can hold a backpack, a small duffel or a soft-side cooler. Stash a sleeping bag behind the padded seat back, and store additional gear, like two folding bag chairs, in the bungee-enclosed hull storage compartment. No need to skimp on gear because the Old Town Vapor 10 recreational kayak can hold a total of 325 pounds of passenger and cargo. A few customers even report taking their dogs along for the ride in this model. Affix your camera, dry box and keys to the sides of the yak using the smaller bungee snaps to keep your equipment up and out of the water. The drain plug, located in the floorboard of the rig, quickly gets rid of excess water in the cockpit. Three models of the Old Town Vapor 10 are available, depending on your preferences. In addition to the Vapor 10 recreational model, Old Town also produces the sporty, stylish Vapor 10XT and the Vapor 10 Angler model. The Vapor 10XT is a few pounds heavier than the standard Vapor 10, but the main difference between the two is the Vapor 10XT kit includes a hatch cover over the day well. The Old Town Vapor 10 angler kayak includes all the features of the recreational Vapor 10, but with a few additional perks for those who love to fish. Flush-mount rod holders keep your gear secure while you hunt for the optimal spot. 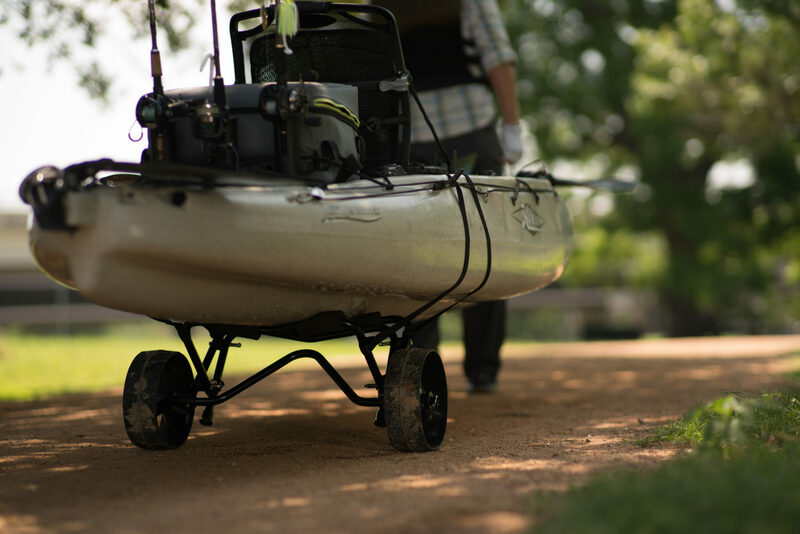 An anchor trolley system is standard with the Angler model, though the anchor must be purchased separately. This one-person sporty hard side weighs only 49 pounds for ease of transport, but the craft can accommodate up to 325 pounds. The extra large cockpit provides easy in-and-out and a comfortable ride for larger adults, too. Meeze says in his Old Town Vapor 10 review on Amazon, that he enjoys taking his 80 lb. dog with him in the Vapor 10. Meeze states that the cockpit provides more than enough room for his buddy. He mentions that the kayak handles better with the extra weight in the bow, but he loves taking his best friend with him on the water. Adam G. noted that he purchased the Vapor 10 because of Old Town’s reputation for producing quality kayaks. He indicated that he was very pleased with his purchase, giving the Vapor 10 five out of five stars. Diane-Cookie, however, was a bit more critical of the Vapor 10, specifically the pronounced keel. She noted that the keel is easily caught by rocks and moving water, and can make the boat difficult to control in whitewater and rugged river bottoms. Secure and steady aptly describes the feel of the ride on the Vapor 10 series. The Angler, as well as the other Vapor 10 models, are built for stability over maneuverability. The Vapor 10 series is an excellent choice for beginners and occasional weekend yakkers. However, what you gain in stability, you somewhat lose in control and navigability. If you want to split the whitewater or speed along the horizon, the Vapor 10 series is probably not your ideal boat. The higher-end Oru Bay Kayak or the TRAK Kayaks Performance Folding Kayak would probably be more suited for your needs. If you are looking for an affordable kayak that will last several years with occasional use, the Vapor 10 series is perfect for you. The Old Town Vapor 10 is an excellent starter boat, ideally for recreational use on ponds and flat lakes. The vast majority of customers who purchased the boat are very satisfied with their purchases, even years later. If you intend to kayak on whitewater, or if you have the need for speed, consider a higher-end craft.